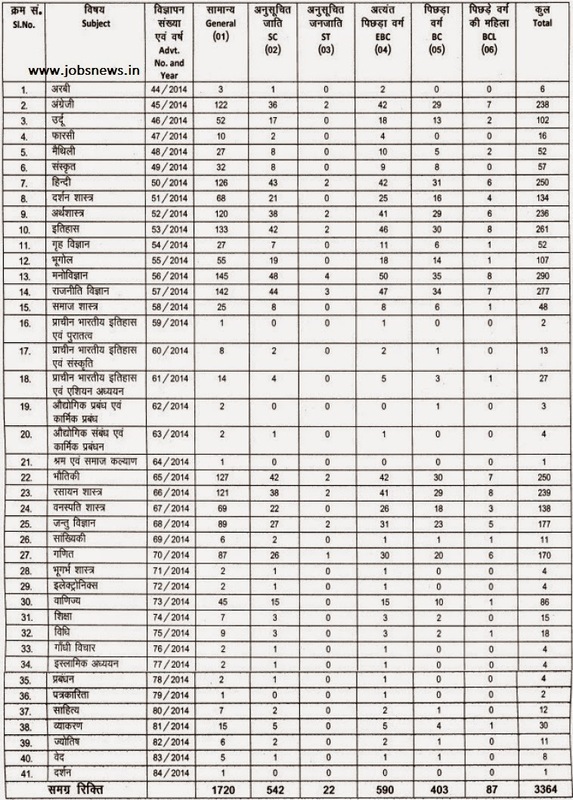 3364 Vacancy of Assistant Professor in BPSC - Download Application form and Apply - Last Date - 20/11/2014 - Latest Employment News, Sarkari Naukri, Current Vacancy and Rozgar Samachar. On the Recommendation of the Education Department, Application are invited for the Assistant Professors in different government Universities of Bihar under different subject head. Pay Scale as recommended by the University Grant Commission from time time to time and accepted by the Government of Bihar. A Candidate should have throughout good academic record with minimum 55 % Marks at the Master's degree or equivalent. A Candidate must have passed NET / SET or equivalent test accredited by U.G.C. The Candidate who have obtained Ph.D Degree on the basis of Minimum standard and Procedure Registration, 2009 framed by the University Grants Commission for M. Phil / Ph.D degree, Shall be exempted from passing the National Eligibility test. Candidate can Download the Application form in A4 Format and fill the form with the required data and Photo. Application have to send the filled Application form to the BPSC office before 20/11/2014. Application fee of Rs. 75 for SC/ ST and Rs. 150/- for General Candidates through Bank Challan. Download the Application form and Challan.